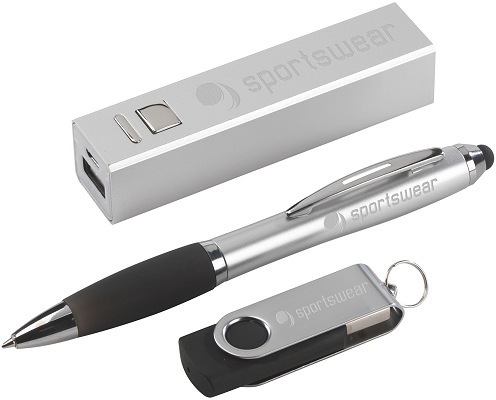 Gift Set of Rectangular Power Bank, USB Stick & Stylus Pen with silver items. 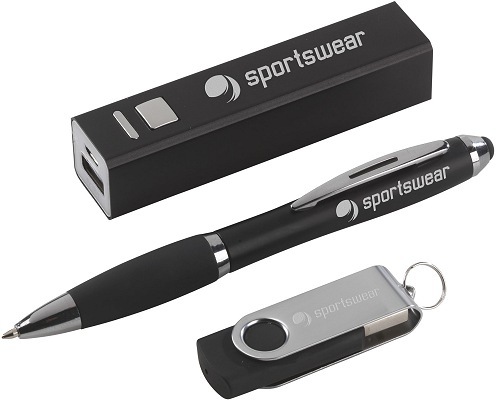 Gift Set of Rectangular Power Bank, USB Stick & Stylus Pen with black items. 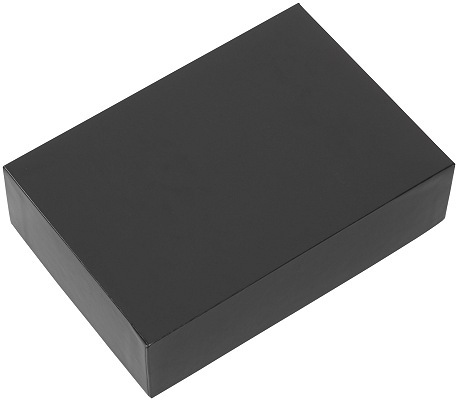 Gift Set of Rectangular Power Bank, USB Stick & Stylus Pen with black card box lid. 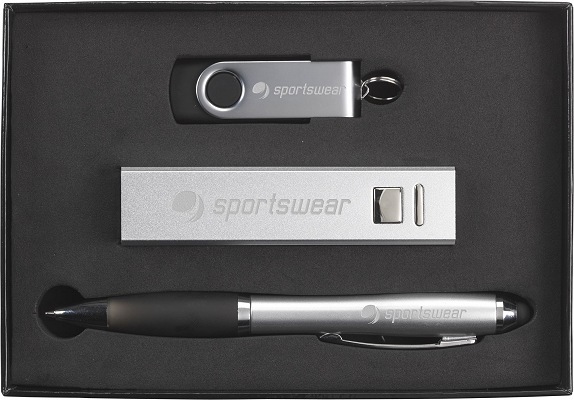 Gift Set of Rectangular Power Bank, USB Stick & Stylus Pen details of the silver set. 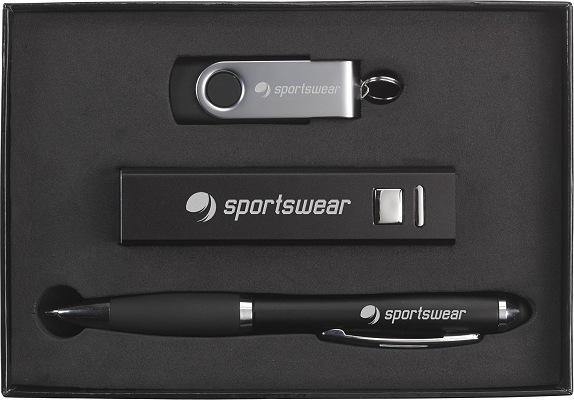 Gift Set of Rectangular Power Bank, USB Stick & Stylus Pen details of the black set. Price includes your logo engraved in one position. Delivery and VAT extra. 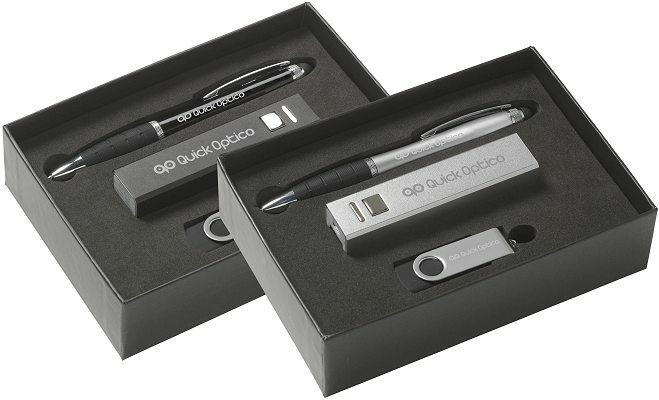 A boxed logo branded gift set containing a rectangular 2600mAh power bank, a twister USB stick and a touch stylus pen with a light-up logo, each with your laser engraved logo. Black and silver versions are available for the power bank and the stylus pen. The Power bank capacity is 2600mAh with a battery indicator light. The twist USB stick is USB 2.0 and you can choose between 4GB to 8GB. The light-Up logo touch pen has a rubber tip for operating touch screens and it including a battery and instructions. Choose between silver coloured or metallic barrel.